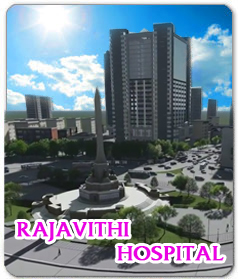 Rajavithi hospital has strategically developed its advanced medical specialty capacity using expertise in each treatment to further study, apply analytical research, evaluate, develop and transfer know-how to provincial hospitals throughout the country by establishing an information infrastructure blended with an effective referrals system of hospitals under the Ministry of Public Health nationwide. The hospital is authorized for international referrals covering a spectrum of medical specialties serving patients sent from other countries. Our Centers of Excellence have been in professional service over three decades. 1. COE for Ear Nose and Throat (ENT) : For 30 years, Rajavithi has been a leading ENT hospital, especially for adults and children with hearing deficiencies. 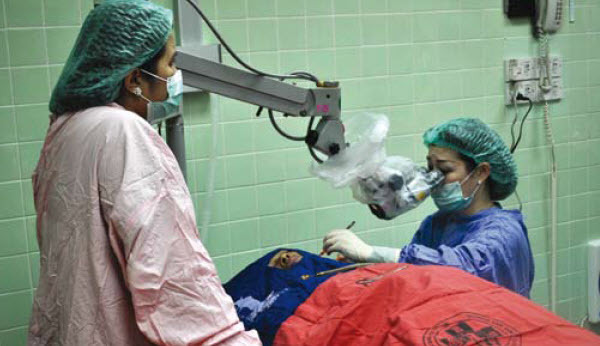 Our medical surgical team is well-known for complicated surgeries employing the Free Tissue Transfer technique. The ENT center of excellence accepts regional and national hospital referrals as well as international referrals, including by email, for examination and treatment. It organizes an annual Asian Temporal Bone Dissection/Ear Surgery Course, and Head and Neck Oncology Course. Highlights include Surgery for Deaf Patient: Cochlear Implantation for hearing and speaking. It is a training center for Otolaryngology H&N surgery, and a mobile medical team has made remote visits in Thailand for over 30 years. Internationally, the mobile team provides medical services in Cambodia , the Lao PDR, Vietnam, People’s Republic of China, Myanmar, and Bhutan. 2. COE for Trauma : established as a Medical Services Department prior to carrying patients from accidents to hospital, and through recovery. Medical teams are set for action even before patient arrival at hospital. Rajavithi’s Trauma Registry exam was developed/merged with Lertsin Hospital and Noparatanarachathani Hospital for Trauma Audit. The ATLS (Advanced Trauma Life Support) Training Center is recognized by The Royal College of Surgeons of Thailand under license of the American College of Surgeons. 3. COE for Head and Neck Cancer : emphasizes curing complicated head and neck cancer for patients also suffering mouth and neck cancer including nose, nostrils, air passages, voice box, thyroid and ears. With international standard treatment by ENT and X-ray, nuclear medical and dental specialists, it also serves as a referral center for over 500 Head and Neck Cancer patients, and is regarded as the topmost national venue. It has held top rank status for technically complicated surgery in Thailand for the past 30 years. With the development of microvascular free flap surgery, it enables major cancer surgery close to important organs and prevents malformation of organs to maintain accuracy aided by Image Guided Radiation Therapy (IGRT). 4. COE for Organ Transplantation : gives new life to patients needing organs such as kidney, liver, heart and lung in continuing evolution. A development of a surgery for mini-incision donor nephrectomy enables kidney donors to be living ones resulting in quick recovery and minimized hospitalization. The center staff have regularly participated in organ transplantation planning in national level. 5. COE for Laparoscopic and Endoscopic Surgery : Rajavithi Hospital is specialized for Endoscopic surgery in general surgery, Obstetric and gynecology Surgery, orthopedic, ENT, cosmetic, heart and chest and neurological surgery. Additionally, professional workshops are held annually for hands-on practice at our modern 8-station intelligent theatre. Our state-of-the-art Endoscopic Surgery device is equipped with a voice-directed multi-directional monitor. 6. COE for Cardiovascular Disease : As the first Cardiovascular surgery at Women’s Hospital, Ministry of Public Health, we have significant proven achievements in heart surgery, especially the endovascular stent for treatment of thoracic aortic aneurysm and dissection of aorta. Also, heart surgery on infants and organ transplants in the chest have succeeded. On the job training has been conducted for heart and lungs since 1983. 7. COE for the Retina : A campaign for diabetic blindness was implemented in national remote areas for diabetic retinopathy screening. Research findings established a heritable error in elderly patients with deteriorating retinas as a cause of blindness in Thailand. Also, a newly developed laser X-ray and eye injection was the world’s first successful case, published in Eyes Journal and widely accepted in the United Kingdom. COE for the Retina is a leader in retinal surgery without stitching enabling patients to recover quickly without pains.